We had to include one belly putter in this years list since they have become so popular. 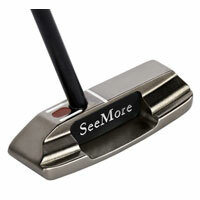 This on is a reliable choice with a solid feel off the putter face and a black classic style blade head. The degrees lie on the model tested was 73 while the loft is 3. The metal milled face is very textured which is to my liking. A 6′ or above person will likely want the 45″ model while a shorter person will prefer the 41″ version. The classic style blade head is heavy to help optimize swing weight for balance and feel. The toe-down design will appeal to many due to the exceptional feel at set up. It also helps develop a repetitive swing path. This putter is very reasonably priced at $119.